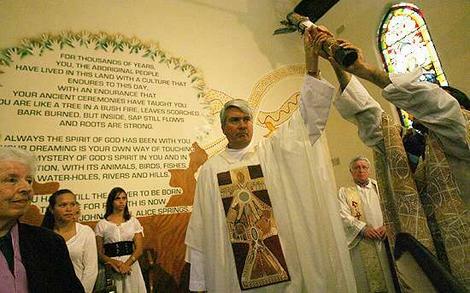 On October 1, 2006 the National Aboriginal and Torres Strait Islander Catholic Council (NATSICC) will celebrate the 20th Anniversary of Pope John Paul ll's visit to Alice Springs and his address to the Aboriginal People. The Message Stick Pass it On relay was launched nationally by none other than Cardinal Pell on 1 May 2005. The Message Stick is a call from the Church to come together united in friendship, fellowship, spirituality and respect, to commemorate this anniversary and recommit to the message of the late Pope. 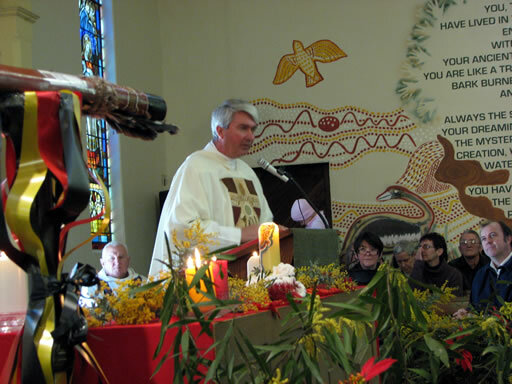 On Sunday the Message Stick was welcomed at St Vincent’s Redfern with a special Mass celebrated by Fr Frank Brennan SJ and the blessing of a magnificent mural commemorating the late Pope's words back in 1986. The mural, which seems to have appeared miraculously overnight (see SMH article), overwhelmed the community. Comments such as "When I walked into the church and saw it, I was fighting back the tears" and "This is our church - we should have done it earlier!" were to be heard over and over. The image below is an attempt to record some of the joy and emotion of the occasion. Frank Brennan's homily is reproduced below. I don’t know how many of you were at Alice Springs twenty years ago when the Pope came. Like this mass, the ceremony started quite late – but not because Frank Cain was outside organising a smoking ceremony or the arrival of a message stick. Pope John Paul II was running late. His specially imported Mercedes Popemobile had broken down. It could not cope with the hellishly hot Central Australian conditions. As a last resort, they even tried throwing ice on the engine. But in the end the pope arrived in Blatherskite Park in a plain white Australian Ford sedan. As it should have been! I was there with the Kununurra mob. They had come to me and said, “Us mob don’t have our own priest, and you don’t have a mob. So you’re our priest, and we will be your mob.” They gave me a red T shirt depicting their dreaming. We all wore yellow headbands. Along the dreaming track, the Pope walked, accompanied by Kaye Mundine, and greeting each mob. We were just next to the Daly River mob. The vestment I wear today comes from Daly River. It was worn by Fr Ted at Mum Shirl’s funeral, and by Bishop David at Ted’s funeral. The church officials planning the pope’s visit had made it clear that he was not allowed to wear the Aboriginal colours. Just before he reached the Daly mob, someone reached out from the crowd and placed a crocheted beanie and stole on him – in the telltale colours of red, black and gold. Our Polish pope was the consummate media performer so he did not remove his new apparel. That was left to a monsignor some minutes later – and not before Louise Pandella, the sister of Miriam Rose Ungunmerr, the artist of this vestment design, stepped forward and presented the pope with her newborn son, Liam. We have all seen that iconic photo. I was in the United States when John Paul died. The US networks featured the photo in much of their funeral coverage. Last month, I was back at Daly River and asked Louise if she was going to pose for a new photo lifting Liam, nicknamed Pope, to the sky. She thought he had grown a little too much for that. Three weeks ago, we welcomed the Message Stick at the Reconciliation Church, La Perouse. We are privileged to have Elsie Heiss, a leader of that church community, present the message stick to your community leader, Frank Cain. How fitting that Elsie was married here in the St Vincent’s Church in 1960 with her first daughter being baptised here in 1965, even before the time of Fr Ted at Redfern. Elsie told me this morning that a lot of things have changed in this church. The altar used to be situated against the eastern wall. Now a fresh mural proclaiming the pope’s message is on that wall. Much has changed, but also much remains the same. Before the scripture readings this morning, we heard local Aboriginal reflections on the Pope’s message, including his words, “The Church herself in Australia will not be fully the Church that Jesus wants her to be until you have made your contribution to her life and until that contribution has been joyfully received by others.” That contribution can be received by the rest of us, only if we are in relationship. I know she will be a little embarrassed and I hope she will forgive me for naming her. Just before mass, while we were waiting and then waiting a little longer, Louise Campbell approached me, introduced herself, and gave me some of the splendid religious art painted by her brother Richard from Bowraville – there were stations of the cross, the resurrection, and the evocative tree painting entitled, “When my Brother Cried”. What a gift to be able to receive such spiritual blessings from a family you have never met. Some years ago, I visited Merrepan Arts, the Women’s Arts Centre at Daly River. One of the women showed me her dot painting of today’s gospel, Jesus feeding the five thousand. In the centre of the painting was a large red dot. The Aboriginal People in that part of the world were evangelised by the Missionaries of the Sacred Heart for many years. So being a typical white fella, I jumped in and asked if the red dot represented Jesus and his Sacred Heart. “No”, she corrected me: “That is the small boy with his five barley loaves and two fish.” Without the boy, there is no feeding. Without his barley loaves and fish, there is just no food. A visitor to this church, I look around and wonder, “This big mob, how can they be fed? 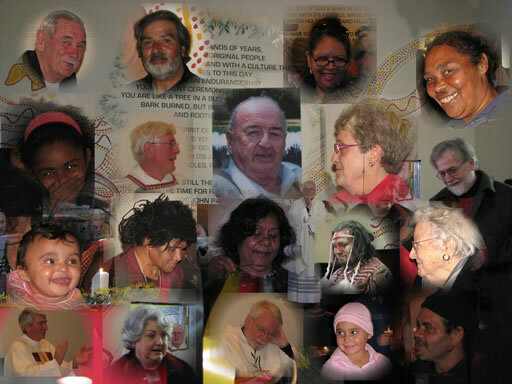 This big mob, how can they be reconciled?” This community is emblematic of modern Australia. Before mass, I met some of the seminarians from the Neocatechumenate – new arrivals in Australia, from Spain, Croatia, Korea, Italy, Brazil, and the Philippines. Then there are those of you descended from the first inhabitants of this land. You two groups are like the two book-ends holding together the rest of us who are the books on the shelf of modern Australia. We hold together as a society and as a church, all of us being connected, from the land’s oldest inhabitants to the newest arrivals. How can we feed each other? How can we be reconciled? All it takes is five barley loaves and two fish. I invite you, the young Aboriginal students here from St Scholastica’s and St. Vincent’s, Potts Point, to look around you. As you contemplate your world and our church, you know there are many problems. You will often think: “How can we do it?” Just remember the small boy in today’s gospel. All it takes is five barley loaves and two fish. But here is the catch. The boy gave everything he had. Only then was Jesus able to feed everyone with sufficient for there to be leftovers. Only then will he be able to reconcile us. We must give and share all we are and have. For thousands of years, you Aboriginal people have lived in this land with a culture that endures to this day, with an endurance that your ancient ceremonies have taught you. You are like a tree in a bush fire, leaves scorched, bark burned, but inside, sap still flows and roots are strong. Always the Spirit of God has been with you. Your Dreaming is your own way of touching the mystery of God’s Sprit in you and in creation, with its animals, birds, fishes, water-holes, rivers and hills. You have til the power to be born. The time for re-birth is now. God our Father, Creator Spirit, we thank you for all your blessings. We thank you for the Pope who came and walked amongst us. We thank you for our mob. We thank you for the inspiration of these words and the sacredness of this place. Together with Mum Shirl and Father Ted and all the ancestors we praise you and ask your blessing on this mural of our Church. In the name of the Father and of the Son and of the Holy Spirit. Amen. At the end of this Eucharist, may the message stick leave this place for the gathering at Alice Springs with a strong word to all who receive the stick on its journey: the Pope’s words are at home etched in our hearts and in our Church. Graffiti in its glory...Father Frank Brennan, centre, at yesterday's ceremony, with the surprise mural behind him. At far left is Marnie Kennedy, the sister of the late Father Ted Kennedy. IT WAS a big day at St Vincent's Redfern yesterday, but Father Gerry Prindiville sat grim-faced through the celebrations. He had come to Mass to find a huge mural had appeared overnight on the east wall of his church. As far as the embattled priest was concerned, this was not a miracle but a crime. "They must have broken in to do it," he told the Herald. "It concerns me that someone can break into my church." The place was jubilant. St Vincent's Catholic church is contested ground and the old crowd - the Aborigines and the social justice mob - were out in force congratulating themselves on this wonderful jape at the expense of Cardinal George Pell's man sent three years ago to straighten out the parish. "We were reclaiming the church for the Aboriginal people," explained Griffo, one of the culprits. "We had to sort of sneak in, not let the priests know what we were doing." He insists entry was not forced. "One of the sisters came and climbed through the window." Planning had been going on for weeks. Once the scaffolding was wheeled into place by 1.30 on Saturday afternoon, the black and white team of painters took six hours to do the tree of hands and the animals - Griffo did the emu - and the lines from Pope John Paul II's famous 1986 speech in Alice Springs: "For thousands of years you, the Aboriginal people, have lived in this land with a culture that endures to this day …"
The paint was dry for yesterday's Mass celebrating the 20th anniversary of that speech and Father Frank Brennan - one of its authors - was on hand for the occasion. 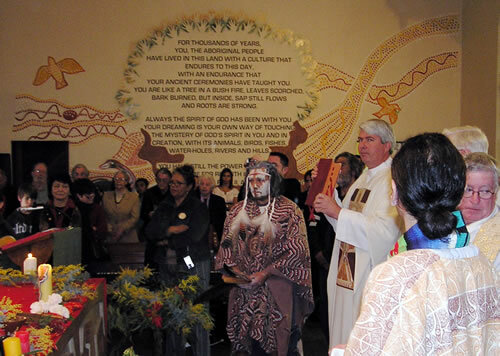 When he called on the Redfern congregation to stand and bless this "permanent" memorial to Aboriginal spirituality, Father Prindiville's arms stayed tightly by his side. The Mass was not brief. Smokers drifted in and out. Shireen Malamoo, still recovering from a bout of pneumonia, raised the roof singing Just a Closer Walk with Thee. Father Brennan preached on the loaves and fishes: "This big mob, how can they be fed? This big mob, how can they be reconciled?" The visiting clergy were scrupulously polite, but the crowd supplied unscripted remarks about the cardinal and the priests he had sent to this freewheeling parish. "This is our church," Griffo explained. "Father Ted gave it to us. It's on our land. In memory of Father Ted we decided to paint the mural." A photograph of the late Father Ted Kennedy, parish priest here for 30 years, hangs behind the altar. So does one of the social worker Mum Shirl, which Father Prindiville removed soon after he came to Redfern in 2003. After protests, walkouts and stories in the press, it went back on the wall. The new man seems grimly aware that he lives in Father Kennedy's shadow. He shrugs when asked how he plans to win his congregation over. Just wait it out? He nods. "The problem is that people won't accept any sort of authority. They have been used to doing their own thing for so long." That's not part of his training as a missionary of the Spanish-based Neocatechumenal Way. Father Prindiville has brought to Redfern an unfamiliar faith in the rules - down to the smallest details. And though the "Block" is just round the corner, he doubts St Vincent's was really a black parish. "There were not many Aboriginals." He is considering the fate of the mural. Of course, he agrees with everything the late Pope said in his Alice Springs speech, which is now all over the end wall of his church, but that's not the point. "I came in here and found this without any warning." Father Prindiville does not feel alone in the difficult decisions he has to make. "I have the support of the cardinal, so that helps me."